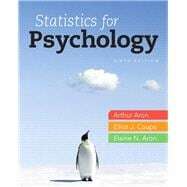 by Aron, Arthur, Ph.D.; Coups, Elliot J., Ph.D.; Aron, Elaine N., Ph.D. Controversy: Should Significance Tests Be Banned? Controversy: What is a Large Correlation? Controversy: Should Statistics Be Controversial?